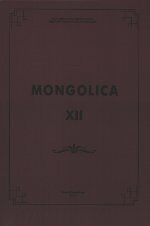 The twelfth edition of Mongolica is dedicated to the 130th anniversary of the birth of the classic of Mongolian studies in Russia, a member of the Academy of Sciences of the USSR, an outstanding specialist in the field of Mongolian linguistics, literature, history and ethnography - Boris Yakovlevich Vladimirtsov (1884-1931). By this momentous date the complete collected works of Vladimirtsov have been published, and the archive of the scholar has been enriched with materials deposited with the St. Petersburg Branch of the Archives of RAS by his relatives. The issue consists of the following parts: Historiography and Source Studies, Literature, Folklore, Linguistics, Reviews, Our anniversaries, and Our Translations. The articles are written by both distinguished scholars and young researchers in the field of Mongolian studies. Reviews of new books make the issue topical. The papers are written in keeping with the research priorities of modern Mongolian studies, with special regard to the matters of history and culture of the Mongolian peoples, which gives the articles great social, historical and practical value. The issue will be of interest not only to the Mongolists, but also to specialists in philology, history and culture, as well as to those interested in the history of the Mongolian peoples and Central Asia. The article is devoted to the analysis of the Mongolian Derbet custom of honoring the Old Turkic stone monument mentioned by Ts.-D. Nominkhanov in his field materials. The author compares this custom with the Kalmyk ritual of worship of the deity Tsagan aav (White Old Man) in front of the coniferous tree ritual pillar on the barrows named ova. The work concludes that the stone images and the wooden ritual pillar are sacred objects connected with ancestor worship that ensure welfare during ritual celebrations — the Ursiyin Nadom of the Mongolian Derbets and the Urs sar of the Kalmyks. The development of Russian-Mongolian relations in the first quarter of the 20th century, the formation of the Mongolian national state and the role of Russia in this process are discussed in this article; a modern characteristic of the study of these problems in Russian and Mongolian historiography is also presented. There is an information about the features of Oirat stationary settlement’s buildings during the period of the Late Middle Age in the article. These buildings were constructed on the lands of nomadic Oirats and for Oirats, which were represented by the disappeared in 18 century nomad people of Zungar Khanship and Kalmyks, who living in the south part of Russia. The article deals with the history of the “Special” Expedition of the Ministry of Agriculture to Mongolia (Монголэкс) during World War I, connected with a mass purchase of cattle and meat. Amid the meat supply crisis in Russia, connected with the enormous consumption of meat products by the army, meat and cattle purchases in neighboring countries began to play a great role. The organization of Mongoleks, which was headed by the known Russian traveler and the expert on Central Asia colonel P. K. Kozlov, became the largest purchasing structure. As a result of the appropriate performance of the organization, the warehouses and stations of Eastern Siberia were stocked with meat that could not be shipped to European Russia in due time. The opposition used this fact in the race for power by spreading news in the press about meat allegedly «decaying» in the winter of 1917 beyond Ural. Anyway, the Russian purchases of products in Mongolia and Manchuria significantly smoothed the unfavorable development of the food crisis in Russia. The activity of Mongoleks allowed to supply meat to the Russian Siberia and partially — to the front of the Russian army. The article, which is based on the fieldwork in Yushu Tibetan Autonomous Prefecture of the Qinghai province during July-August 2013, deals with the level of preservation and existence of the oral tradition of the Tibetan heroic epic “Ling Gesar”. The humour culture of the Mongols has a centuries-long history of development. Every decade and century it absorbed new shades of different kinds of the comic, such as humour, satire and irony. At the same time it has preserved its continuity and national flavour. Since the beginning of the 20th century the variety of comic works in Mongolian literature has been dazzling, keeping strong connection with the traditions of folklore and literature of the 19th century. V. Inzhinash was the father of three kinds of novels: historical, domestic (common) and adventure (the novel with elements of satire and fantasy). He was not only the founder of new prosaic literature, but also the successor of poetic tradition. His heritage is very rich. The brightness of images and the abundance of metaphors in the prose of V. Inzhinash are connected with the well-developed poetic tradition of Mongolian literature. Chinese classical literature also influenced the poetics of V. Inzhinash. The brilliant use of a wide spectrum of traditional artistic techniques and epic methods of narration allows us to consider V. Inzhinash’s creation an essential part of the whole literary process in Mongolia. The article deals with a folk parable about the functional purpose of the musical instrument dombra, which accompanied the performance of the Kalmyk folk songs “dombrt keldg dud” (songs performed to the dombra). The genre nature of the songs is analyzed in close relationship with the dombra. The article is devoted to the concept of “torma” in the original and translated texts of the fairy tales “Siddhi- Kür”. The article analyzes the “depth of perception” of the Buddhist phenomenon of torma which transmits the national flavour not only in the original text, but also in the translation. The article is of interest to folklorists, ethnographers and cultural specialists. «The Review of the Journey into the Kalmyk Steppe during the summer of 1886» belongs to the personal collection of K. F. Golstunsky (1831-1899) kept at the Archives of Orientalists at the IOM RAS. Scientific interests of K. F. Golstunsky included all aspects of life in the Kalmyk steppe. The author described the purpose of his journey as an intention to study the spoken Kalmyk language. These materials will be highly interesting for researchers as well as readers who would like to know more about life and culture of the Kalmyks. At the IOM Department of the Manuscripts and Documents, The Catalogue of Texts of the Tibetan Buddhist Canon Kept at the Institute of Oriental Manuscripts, RAS. Vol. 1: Bka’ ’gyur and Bstan ’gyur, by A.V.Zorin (chief editor), B.L.Mitruev, S.S.Sabrukova, A.A.Sizova, will be discussed.